The method of cooking on a heated surface is a very ancient one. If you only have a wood or peat fuelled fire for your cooking, it is a simple matter to bury a stone in the embers, or to prop a metal pan over the flames in order to heat the cooking surface. The Welsh have similar girdle-cooked foods of long heritage - such as crempogs (ffroes) and Welsh cakes (The Oxford Companion to Food mentions a theory that the Scottish miners who travelled south to work in the Welsh coal districts of Glamorganshire, were responsible for bringing the girdle pancake recipe with them.). Northern England shared the oatcake with the Scottish Highlands, as both areas were well suited to the cultivation of oats, although different regions prepared the oatcakes in slightly different way. The 'girdle' used by the Scots for their cooking, is a round, cast-iron flat plate, with a semi-circular handle. The town of Culross in Fife, was granted a royal charter for their manufacture back in 1599 - this gave Culross a monopoly on the production of girdles for many years. The National Trust for Scotland has been working to preserve the town of Culross since the 1930s, so by the 20th century the success of Culross girdles had diminished somewhat. I have not been to the town, but it looks a handsome place. 1. First grease your girdle (I love that instruction) - use a oil as butter will burn, and then put on the hob to heat. 2. Sift the flour into a bowl and add the pinch of salt, and then tip in the sugar. 3. Crack the egg into the milk (best not to try doing this into the bottle), and whisk. 4. Pour the egg and milk liquid into the dry ingredients, and mix to form a smooth batter. 5. Test that the girdle is hot enough by putting a teaspoonsworth of batter onto it. You should have a fairy-size pancake cooked for you in less than a minute. 6. For the main-event pancakes, use a tablespoon to drop the batter onto the girdle. I used the back of the spoon to form the dollops into more aesthetic rounds. 7. Keep a beady eye on the batter. When the surface has become covered in bubbles get ready to flip them over using a palette knife (please ignore the scratchy metal one I am using). Don't worry if the underside isn't as coloured as you would like it to be, you can always turn the pancake over for an extra girdling. 8. When cooked remove the pancakes from the girdle, and wrap in clean tea towel to keep moist. The jury is out on whether to eat these hot from the girdle, or leave them to cool. Either way I think that they should be eaten on the day of cooking. This recipe makes about 18 pancakes, so a good quantity for Sunday night tea for two. Consume with butter, or butter and jam. I also love pancakes of any kind and this recipe looks pretty easy. I have to try making this sometime. Can you add fruit like blueberries to this recipe? which kind of oil do you grease your girdle with? I confess that my girdle is so super non-stick, that I didn't actually need to grease it! However, I would normally use a smudge of sunflower oil, or something like a grapeseed or maize oil. I think olive oil is fine, just not your delicious extra-virgin cold-pressed oil - too much flavour and too expensive! Sunflower oil can be useful for cake making so is worth having in the cupboard. 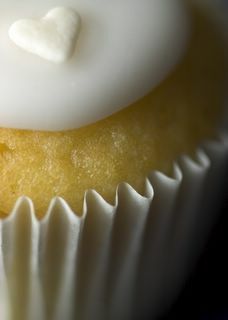 Some muffin recipes need an oil for their fat content. My mum has a great chocolate cake recipe that uses sunflower (or any other vegetable oil), it makes for a very moist cake. Looks yummy. This might sound like a silly question, but in the absences of a girdle (yes, that word makes me giggle too!) I'm assuming I can use a large heavy-based frying pan. Cheers! I'm afraid I don't know of a source for sugar music notes - somebody enterprising perhaps needs to get on the case. The white heart was from a set of sprinkles picked up from Waitrose at some point (probably pre-Valentine's day). Waitrose seem to offer seasonal cake decorations so you have to keep going to have a look - just in case you miss out! I have marked a few online sources, but I have yet to order from any of them. Might be worth a look, or even contacting them to see if they know of other sources for more specialist decorations. A heavy-based frying pan would be fine for these pancakes. You won't be able to cook as many at once, but cooking in batches means that the first batch will be cool enough to eat by the time the last batch is done. Perfect! Well, thank-you very much Valentina. Not all my cooking works out, but I have made these pancakes many times, so I guess the practice paid off! or three, possibly. . . 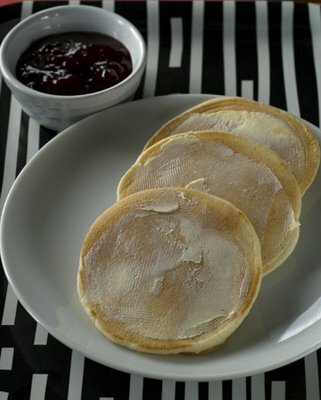 These are a bit of a family favourite, though around our neck of the woods they were known as "drop scones". The consistency of this mixture is thick enough to not go scampering off across the pan. Add the mixture to the pan using a suitably sized spoon, then use the back of the spoon to swirl the mix into a circular shape. A girdle? or did you mean a griddle? Girdle is the Scottish name for griddle - they are one and the same. I made them following your recipe and they wre absolutely delicious. Thanks for the recipe - these are lovely! I haven't been able to replicate the pancakes my Granny used to make until I found this recipe. We all love them, especially with butter and homemade raspberry jam! My Mum (a scottish cookery teacher no less) always uses butter to grease her girdle. If you save the wrapping from a block of butter and then use that to spread a tiny amount of butter around it'll work perfectly. I dont have a set of scales - anyone have a conversion for how many cups of flour etc to use?? I just made these - fantastic! I don't have scales either so I used 10.5 tablespoons of flour and 2 tablespoons of caster sugar. Thanks for the lovely recipe! Grease the gridle, not girdle. thanks for the recipe. WoW Wot can i say anna,these are really delicious .i just made them with my kids we had so much fun . mine keeps sticking to the pan and i greased it. do you think that's why?? I don't think that adding oil to the mix would make the pancakes stick. If you greased the pan, then you have done everything right. Maybe the pan was too hot and had burnt off? I have a pesky frying pan, that no matter what I use to fry with (oil, butter etc.) food ALWAYS sticks. Maybe you too have a pesky piece of kitchen equipment? Absolutely gorgeous! The best I've ever made, definately worth a try! Btw do you by any chance have the chocolate cake recipe on here because I haven't been able to find one that doesn't taste awful and yours sounds delicious? u need to do a scots breakfast with these ... crisp off some bacon then do the pancakes and sliced mushrooms in the burn off with black pudding lorne sausage and cluttie pudding. Then call the doctor cos u r gonna have a heart attack. My wife made me some on the griddle, wearing a girdle. Needless to say we ate the pancakes cold!! Great stuff! Good old classic scotch pancakes! Thanks! Hello, could you tell me the ratio of baking powder I wold need to create self-raising flour, as I live in Sweden and it isn't available here. Thanks! You will need approximately 1 and a half to two teaspoons of baking powder to 250g of plain flour. The amount will vary according to how many eggs (or other raising agents) you are using in the recipe. 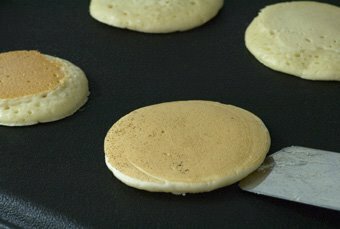 For pancakes I think you can err on the lower side as they need to be light rather than spongey! My mum used a lump of something 'natural' for greasing the girdle - I suspect it was suet, straight from the animal, it was very firm. I never thought of asking what it was. In those days, it was assumed as a boy,I'd never cook. There is a joy in making pancakes, any type, Scotch, American or even English - probably because it is so easy. Just did these, and I know it's been said before but they were GORGEOUS even though I've never done them before! Hi. Thank you for sharing the recipe. I have made them this morning and the batch just disappeared! Will be making them again soon. Would you be able to share your mum's chocolate recipe made with oil please. I have been searching for a recipe like this for a long time. I am seeing my mum in the next few days, so I shall get her to impart her chocolate cake recipe to me. Keep your eyes on this blog and hopefully I will be able to bake and post about the cake in the next week or (half-term japes allowing). we have to write about it and everything... ! Just in time for breakfast this morning - and they were delicious! I can't believe my 8 year old ate six of them! its hard enough getting her to eat anything normally! I made these using your recipe,adding sultanas and my 6yr old daughter loved them-she thinks i'm brilliant now!thanks! So mouthwatering! !I like listening to the music of avril. 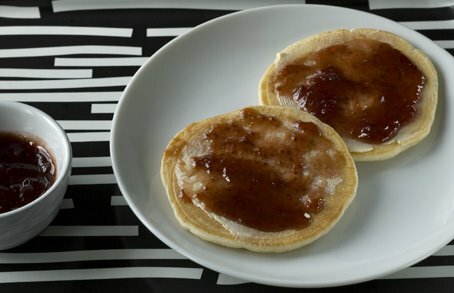 You could add melted butter and covering them with jelly milk(dulce de leche, en español) It's absolutely delicious! Thank you. That recipe (double quantities, three small eggs) worked brilliantly.We'll probably do another batch tomorrow. i used to make pancakes with my grandad on his girdle : this brings back memories, great recipe! hey just wondering, how many should this make because i may need to double it as i only have a goose egg at home so thats equivalent to two or three hens eggs...? Good recipe. Very tasty pancakes. Just made a batch & already guzzled by my 5 year old and me. Highly recommend this recipe. i have tried for years to make pancakes like my granny used to make on her gridle will no sucess. until today just finished making theses and they are soooo good ate 3 already.thanks for recipe. Just made these for me and the hubby for breakfast!! Had them with toffee sauce. So easy to make too! My dog liked these. My boyfriend left his plate unattended for a moment and the naughty terrier scoffed half of his breakfast. He's never stolen our food before. I wouldn't have mided too much but I got the blame! I remember making Scotch pancakes in the late 90s. I got a recipe from an old book and remember putting 2 tablespoons of melted butter into the mixture. I must make some very soon as these look delicious. I would love to put some thinly sliced salted butter on them and a pinch of sugar. Thanks for the recipe! Our pancake pan is non-stick, so no greasing. Super easy for breakfast -- my toddler was delighted and is now running around on a jammy high! Made them for the family and neighbours this morning, lovely! I make american pancakes a lot, but i never weigh the ingredients. I use 4 heaped dessert spoons of flour per egg and then milk to leave it thick enough not to spread out. are 4 heaped spoons close to 120g? They look pretty similar. Very tasty but a bit unhealthy with enough butter and maple syrup. Made these today and they were quite yummy (only half 1.5% milk to hand). The only issue I had was getting the temperature for cooking them. So some were darker brown than I would like. Firstly will it work if i use a small frying pan as i do not have a girdle! Secondly, if i made the batter earlier in the day and made the pancakes in the evening would they still be okay? Thanks! Castor Sugar? Never seen that in the stores here (Germany). Will normal white sugar work? Hope so as I used to love these as a kid. Yes, Stan, it was probably suet your Mum used to grease the Girdle. The panscones were also delicious fried with the bacon although not very good for the cholesterol! We must be showing our age as youngsters nowadays only know the kind of salty bacon which comes pre-packed in plastic and is full of water ! Linked to this site from another to see if this could possibly be a better recipe than mine - it's exactly the same!!! I have these for breakfast most mornings, but use wheat free self-raising flour which works well, I also add blueberries - yummie! Been using this recipe for nearly 40 years now and they turn out every time. I no longer can eat eggs, just add the same weight of extra milk instead. When we have any old bananas, I mash one up and put that in the mix and it makes a wonderful dessert pikelet (Mum called them) with ice cream. I use either oil or melted butter or melted margarine depending on what is available and it always turns out. I leave mine sit for 30 minutes between mixing and cooking for extra YUM. When the kids were little I always made up a double or triple quantity batches. Down to single batches with no kids at home. Try my vegan scotch pancakes. 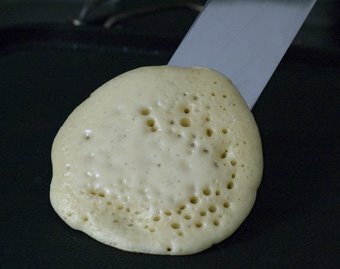 My grandma (who was a master pancake maker and 100%Scottish) used to add a nob of melted butter into her batter mix. It helped stop them sticking (and she always greased the girdle with butter) and also helped keep them fresh for 2 or 3 days. Not they they hung around long when we were visiting! They freeze brilliantly too. Delicious recipe, you've got these pancakes to absolute perfection! It is correctly called a 'girdle' in Scotland. GIRDLE, n. A met. form of Eng. griddle, a circular iron plate with hooped handle, suspended or placed over the fire and used for baking scones, oat-cakes, etc. Gen.Sc. Common also in n.Eng., Som. & Dev. dial. Also girdel, †girdill (Ayr. 1744 Sc. Journal (1848) I. 334) and reduced form girl(e) (Rnf. 1813 E. Picken Poems II., Gl. 174; ‡Cai.7 1954). Also used attrib. Hence girdleful, as much as a girdle will hold. Well, these pancakes look delicious, unlike British breakfast lol I really love pancakes so im trying all the recipes, I even love pancakes cooking game Papas Pancakeria xD. Thanks for the recipe.